Blood is basically a type of a connective tissue which is found in the human body in fluid state. It is made up of plasma which is a highly viscous liquid and 3 different types of blood cells that are floating around in it. 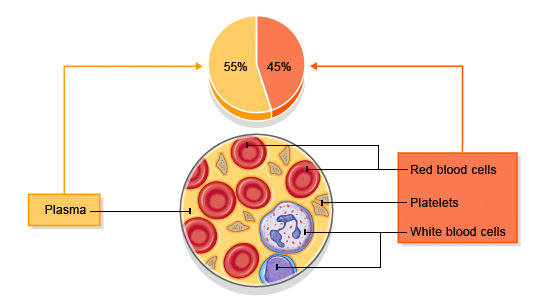 Almost 92% of the plasma is water while the rest consists of enzymes, hormones, antibodies, nutrients, gases, salts, proteins and metabolites of various kinds. Besides plasma, the cellular constituents of blood are red and white blood cells and platelets. Blood is the primary means of transport in the body that is responsible for transporting important nutrients and materials to and from the cells and molecules that make up our body. It is the duty of blood to first take the oxygen processed by the lungs to all the cells of the body and then to collect the carbon dioxide from the cells and deliver it to the lungs. It is also tasked with the job of collecting metabolic waste from up and down the body and take it to the kidneys for excretion. Blood also has to perform the task of delivering the nutrients and glucose generated by the organs of the digestive system to the other parts of the body including the liver. In addition to these tasks, blood also has to carry out the transportation of hormones produced by the glands of the endocrine system. Blood performs the important task of protecting the body from the threat of infections and disease causing bacteria. The white blood cells found in blood are responsible for safeguarding the different organs of the body by producing antibodies and proteins which are capable of fighting off and killing the germs and viruses that can causes serious damage to the body cells. The platelets present in blood handle the task of limiting blood loss in the wake of an injury by helping the blood to clot quickly. Blood is also a regulator of many factors in the body. It oversees the temperature of the body and maintains it to a level that is tolerated by the body with ease. Blood is also responsible for controlling the concentration of Hydrogen ions in the body, which are also known as pH balance. The administration of the levels of water and salt required by each cell of the body also falls under the regulation duties of blood. Another regulatory task performed by blood is to control the blood pressure and restrict it under a normal range. Plasma is the most abundant component of blood. It has a number of functions which includes carrying glucose which is the most important nutrient required by each cell for generating energy. The other nutrients that are also carried by plasma include vitamins, cholesterol, amino acids, triglycerides and fatty acids. All of these nutrients are carried by plasma to and from each and every cell present in the body. Plasma is also responsible for the transportation of Cortisol and thyroxin hormones, which attach themselves to the plasma proteins and are then taken to all parts of the body. Homeostasis and management of the functioning of cells is also among the duties performed by plasma with the help of the inorganic ions that it contains in large quantities. Healing of wounds and stopping spillage of blood through clotting is another function of plasma which is made possible due to the presence of clotting agents in it. Plasma even plays a part in helping the body fight against the germs and infections thanks to the antibodies named gammaglobulins that are present in it. The infections that threaten to damage the body are handled by the white blood cells found in blood. White blood cells contain bacterial agents trying to penetrate into the body. These cells which are also known by the name of leukocytes are formed in the stem cells of the bone morrow and start circulating in the body by means of blood as well as the lymph fluid. The whole immune system of a human body is dependent on these white blood cells to identify the pathogens, cells with cancerous material in them and matters which is foreign to the body. In addition to identifying them, leukocytes are also tasked with the duty of destroying and cleaning the body of these enemy cells. The main job assigned to the red blood cells present in the blood is to make sure that the oxygen is delivered to all the cells of the body when the pumping of the blood has been carried out by the heart. The red blood cells have a very quick speed at which they travel through both the veins and arteries. The veins have a relatively smaller wall around them as compared to the arteries since the pressure of the blood is not too intense when it passes through them in comparison to the arteries. The platelets are the lightest and the smallest components of blood. Due to their small size they usually travel near the walls of the vessels carrying blood. The wall of the blood vessels which is made up of special cells named endothelium stop the platelets from sticking to them. However, in the case of an injury, this layer of endothelium cells gets damaged and the blood starts flowing out from the blood vessels. When this happens the platelets react immediately and get attracted by the tough fiber which surrounds the walls of the blood vessels. The platelets then stick to the fibers and begin changing their shape thereby making a type of seal which stops the blood from flowing out of the body. Hope this article has clearly illastrated the functions of blood.